This process is for impregnating the edges and faces of steel tools with Tungsten Carbide, giving an increase in surface hardness and resistance to abrasion, whilst retaining the strength and toughness of the original material. Applied to localised areas on the cutting, relief or forming edges of tools, the treatment gives substantial improvement in life between regrinds, increasing production efficiency and saving on tool cost. It is particularly effective when applied underneath punching die cutting lands, the extra roughness on the relieved surface retaining the punched slugs in the die. It provides a certain cure to the vexing problem of slug retention and tool smashes. For the above purposes, layer thicknesses are used which are finely controllable between 0.003mm and 0.05mm (0.0001" up to 0.002"). Greater thicknesses, up to 0.4mm (0.016"), can be produced as rough surfaces in Carbinite� carbide which are of use for "gripping" applications, such as for paper sheet handling, in collets and grippers for tube drawing mills or billet-handling processes. 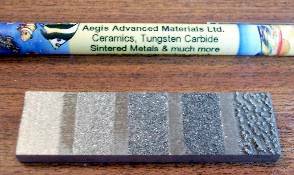 Once the carbide particles are deposited they are metallurgically bonded to the parent metal and so are most reluctant to strip off. Click the picture for details of these thick deposits which are so far only available as a sub-contracted service. Until 2001 we were selling the "Hardedge" unit (pictured right) for this purpose, which was a British designed and built machine, proven by decades of useage around the world. However, all good things come to an end, and the owner of the producing company decided to retire, leaving noone to continue supplying and supporting the units. Then we met the Rocklin Manufacturing Co and realised that while Hardedge had been selling well in Europe and Asia, "Rocklinizers" had also been selling well in the USA and had even developed new capabilities that Hardedge didn't have, such as the ability to deposit Titanium Carbide onto tungsten carbide tooling and build up worn steel parts with "Rockhard" electrodes. If you would like your job coated for you, we can do this here in Bewdley so long as it is within the capabilities of the Rocklin 500 model. Please contact us before sending in work for processing. We also work with another US company who does not supply units, but can do Impregnated coatings on a subcontract basis - also having the ability to deposit much thicker coatings than a Rocklinizer or Hardedge can, up to 0.4mm thickness (0.016"). They can also coat much bigger areas than would be addressed with a Rocklinizer - and can even coat down the inside of steel tubes, if that is required. The very thick coatings tend to be extremely rough - as shown in the photo at the top of this page. Moulds: Plastic Injection, Die Casting, Glass, Rubber (sprues, gates and ejector pins). Metal Cutting: Form Tools, Milling, Reaming, Broaching, Drilling. Drawing Dies: Wire Drawing, Tube Extrusion, Ferrous and Non Ferrous Sections. Mechanical Parts: Feed Blades, Gripper Rails, Cams, Slideways, Bowl Feeder, Chutes, Power Screwdriver Bits, all parts subject to wear. The process involves creating a series of explosive sparks between the conductive workpiece and the deposition electrode. 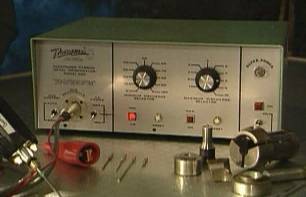 The spark is generated by discharging a capacitor which has been charged by a direct current. The discharge results in the impregnation of small particles of Tungsten Carbide, or whatever material the electrode is made of, into the workpiece. Continuous sparking and traversing a tungsten carbide electrode over a small area produces a top layer of Tungsten Carbide of pre-determined thickness on the workpiece. Once the area is covered no further deposit or build-up occurs, unless the 'energy' control on the unit is turned up, when a thicker layer will result. The process is quick and can be done in situ if necessary. Using a tungsten carbide electrode, the surface produced has the hardness of Tungsten Carbide, 70-76Rc, and is part of the base material, therefore it cannot flake or chip off. The process is cold and does not affect the temper or toughness of the base material. The application of carbide to the surface to be treated is very simple, the main control of the energy in the system being set by a dial on the front of the Rocklinizer, which determines the thickness of the layer being deposited. Going back over a coated area more than once does not build up an uneven coat, but does tend to densify the layer previously deposited, ensuring that no uncoated areas remain. Depending on the model selected, Rocklinizers can deposit a layer of Tungsten Carbide up to 0.15mm thick, which, having a slightly rough surface, helps to retain lubricant especially in deep draw and bending tools. Carbide Impregnation treatment will not turn a high-speed tool into a carbide tool, but will give improvement to its abrasion resistance and therefore its life. Rocklinizers are available in 4 models designed to operate over the range 100-120v or 200-240v, 50-60Hz with various power levels and other features. They range in weight from approx 12Kg for the model 369 (smallest) up to approx 22 Kg for model 600 (largest).